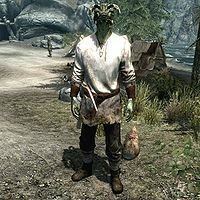 Derkeethus is an Argonian ranger and a miner of Darkwater Crossing in Eastmarch. 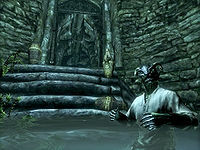 Several residents of Darkwater Crossing may tell you he has gone missing before you find him in Darkwater Pass, being held captive by Falmer. Rescuing him will increase his disposition towards you. Derkeethus can become your follower after rescue, as well as a potential candidate for marriage and for joining the Blades. He is trained in One-handed and Light Armor and tends to dual-wield weapons when not using a bow. However, like Annekke, he equips a pickaxe as an offhand weapon, and will not properly dual wield like Jenassa. He wears a set of miner's clothes and a pair of boots, and is equipped with an iron dagger and a hunting bow supplemented by twelve steel arrows. He also carries some lower-class items and gold. Only two people back in Darkwater Crossing will tell you that he is missing. Hrefna will tell you, "Derkeethus used to take me diving way down deep in the river. I miss him," while Derkeethus' friend, Sondas Drenim, has this to say about the crossing: "Those falls... dangerous place. Derkeethus thought he could find some good fish in the pools. Haven't heard from him in a long while." If you manage to reach him, he will run up to you, giving you the option to ask who he is. Doing this will prompt him to answer, "Derkeethus, from Darkwater Crossing. Should have known better than to swim all the way to the falls. Please, get me out of here!" He will follow you until you get him out of the cave, when he will exclaim, "Thanks! I'm out!" as he heads home. Once he is back in Darkwater Crossing, he will assume his normal schedule: he sleeps on a camp bed from midnight to 8am, and starts his day with a two-hour breakfast. He goes to work in the local mine until 7pm, when he spends the evening relaxing by the campfire. Recruited "We are in this together, yes?" Spoken to "I will wait." "May the Hist guide us." "You are ready to move, yes?" "To Oblivion and back, as they say." "Ours is to follow, friend." Enemies are nearby "I have a feeling there's going to be trouble." Asked to trade items "Need me to carry something?" Told what to do "Go ahead. What is it?" Casting a Rally spell on him "I feel... unbeatable." Selecting what to do "What do you want?" Before doing as told "As you say, it will happen." Healed "Ah! That felt refreshing." Talked to while he is waiting "Whenever you're ready to leave." Told to wait "I'll keep watch from here." Told to do an impossible command "That can't be done." Told to follow "I will walk alongside you." "Maybe you want to rethink what you're asking?" Approaching a Dwarven ruin "I dislike lurking near dwarven cities. It's like their ghosts are watching us." Approaching a cave "Look, a cave. A fine place to find trouble." Approaching a Nordic ruin "Look at those ruins. How long have they stood here, I wonder?" Nearing an impressive sight "By the Hist, what a sight.... [sic]"
During battle "Time for you to die!" "Yield, and I may still show mercy!" Dismissed "I'll be heading home, then, if you need me." 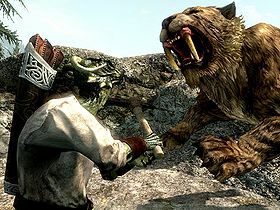 Derkeethus is the only Argonian follower available in Skyrim. Derkeethus is one of only three Argonians in the game who can be married. Derkeethus' essential status does not change to normal after his quest. Derkeethus may occasionally follow you to the door of the cave but refuse to exit. Reloading older save points may not fix this issue. Waiting for the dungeon content to respawn may fix this. A workaround for this problem is to go outside the cave, open the console and type prid 0001B08D and moveto player and then talk to him, this will finish the quest. Another workaround is to try to see if he will follow you through the second door out; both lead to the same entrance, but only one leads out. If married or recruited for the Blades, he will attempt to return to Darkwater Crossing every day, thus making him very hard to get hold of, since all purchasable homes and Sky Haven Temple are quite a long distance away from Darkwater Crossing. Derkeethus may be found in Darkwater Crossing. He will talk to you as if you're in the cave and thus initiate the quest. He can be stopped from following you by completing the quest through the "setstage" console command. Derkeethus will occasionally be out of his cage, especially if you rest in the area above it. This makes it much easier to take him out of the Falmer infested area. ? Derkeethus's mood is set to "afraid". As a result, he always has a fearful expression when outside of dialogue or combat. ? If you marry Derkeethus and adopt a childHF, he cannot be asked how the children are doing as he has no recorded dialogue for it. This page was last modified on 15 January 2016, at 14:33.